Our stylish and spacious waterfront self-catering apartment has a breathtakingly beautiful 180 degree panoramic view of the Grand Harbour and Three Cities. 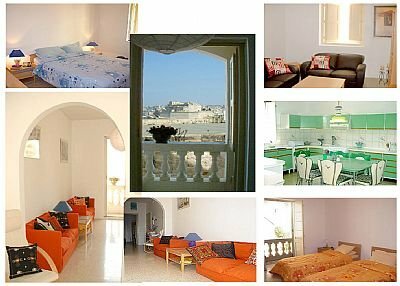 The apartment is situated at Dahlet Gnien is-Sultan ("the site of the Sultans Garden") beneath the bastions of Valletta and is a 2-minute stroll from the heart of the Old City. It sleeps up to 8 people (one double bedroom, one twin bedroom and two double sofa beds), has a well equipped kitchen with brand new appliances, washing machine/ironing facilities, bath/shower room plus separate second guest toilet, air-conditioning/heating, separate TV lounge/study area with cable TV, harbour view balcony, a telephone (for use with Easyline phone cards - a prepaid phone card available from most newsagents or Maltacom outlets) and a roof garden for sunbathing. There is street parking directly outside in a quiet cul-de-sac in a historic residential area. Parking outside the building will require parking tickets but there is a large 'park n ride' car park in nearby Floriana designed to keep traffic out of lovely Valletta, which is small enough to be explored on foot. The nearest bar is the delightful George's Bar (about 100 yards from apartment) where you will receive a 10% if you say you are a guest at our apartment. George's is famous for the jazz nights they hold every Friday during the summer months, with the steps outside the bar bedecked with cushions and candles as jazz lovers sit listening to local bands against the backdrop of the night view across the Grand Harbour. Magical!